Rob Rowlson, the Town of West Hartford’s Director of Community Services, makes no bones about it: too often planning can be an obstacle to private investment and development. 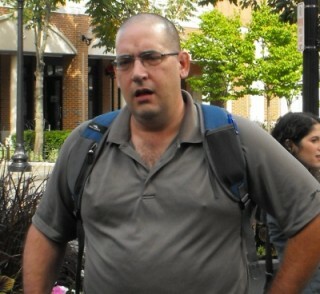 Rowlson proudly says he’s “never written a report for anyone.” A waste of time. Instead, better to focus on providing a climate where developers will want to come into your community. “You take what the market gives you, and then you tweak it,” he adds. On a beautiful Friday morning, I joined about twenty planners attending the Southern New England American Planning Association conference to visit West Hartford, and hear much of our “conventional wisdom” about the value of carefully preparing detailed plans and design standards challenged. But first, a little about West Hartford and what we came to see. West Hartford’s population is about 62,000. It’s a relatively wealthy town (or as Rowlson noted, really a “small city”) with income at 115% of the regional median. At the same time, there’s a wide range of household incomes within the town. One very important fact highlighted to us: 85% of West Hartford’s grand list is from residential property. As a result, Rowlson said, “a key community goal is for MORE commercial development.” I emphasized the word MORE because Rowlson clearly did. With a background in economic development, Rowlson took a job with the Town of West Hartford in 1996 to help address this goal -- one that, in the mid-1990s faced a challenge from the expanding Westfarms Mall just three miles down the road, and just across the town line separating West Hartford from Farmington. 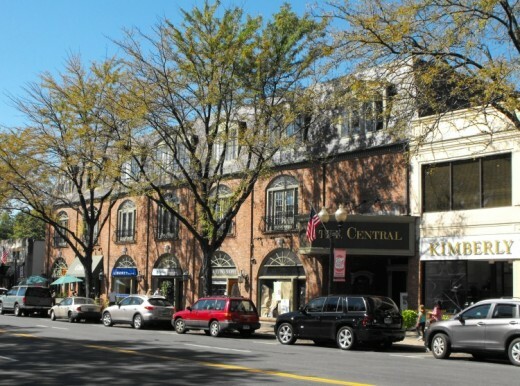 West Hartford had -- and still has at its core -- a very substantial retail development called West Hartford Center, with some 200,000 square feet of retail space (but compare that to over 1.2 million square feet in the upscale Westfarms Mall). But when the Mall expanded, said Rowlson, it was as if “the lifeblood was drained out of West Hartford Center.” But it did send a wake up call both to the merchants and to the town government. 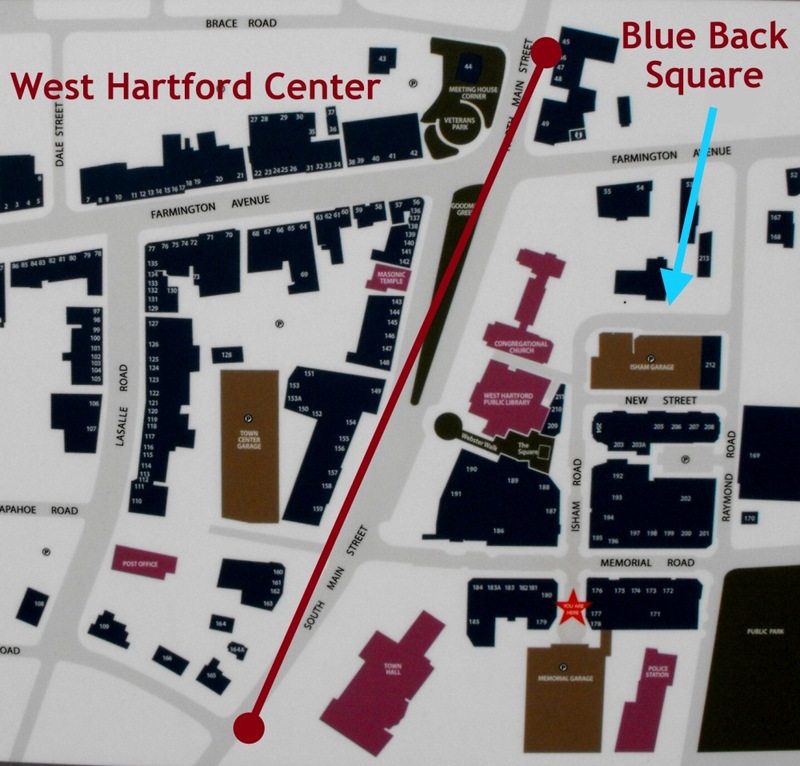 West Hartford Center is on the west side of Main Street (the red line I inserted); the newer Blue Back Square is on the east side. Blue Back Square added 350,000 square feet of retail space to the 200,00 square feet already in West Hartford Center. 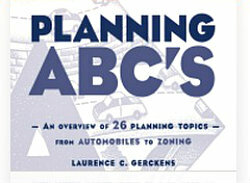 In the map, retail is in dark blue; civic uses in maroon; and garages in brown. Click on image to view it at larger size. More on Blue Back Square in part II of this post. This block along Farmington Avenue in West Hartford Center is typical. Note the ample street trees -- something found throughout West Hartford Center and Blue Back Square. Attractive brick paving blocks line all the sidewalks in West Hartford Center, helping create a more visually attractive setting. “I knew there was a big missing opportunity,” Rowlson told us. 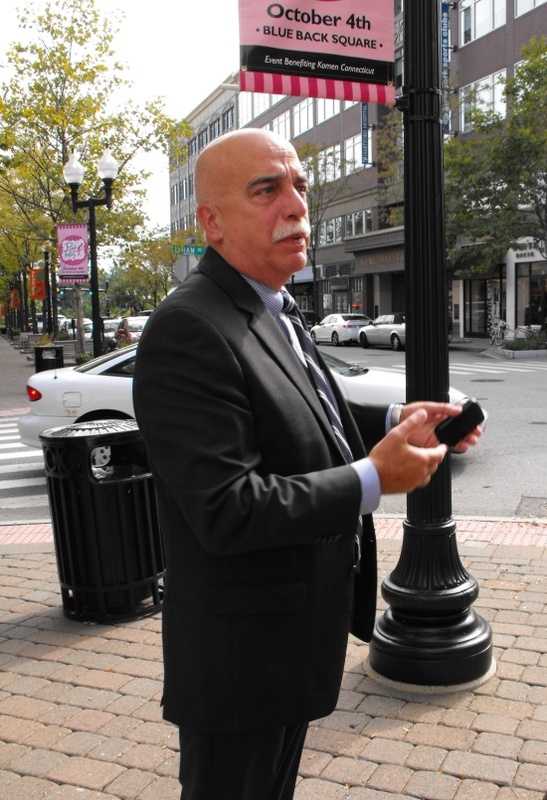 His first order of business in working for the Town -- strengthen West Hartford Center. Merchants began to organize; a marketing campaign was undertaken; and the Town began to invest in infrastructure improvements, such as bricking the sidewalks and installing more attractive street lighting. It was at that time that the first signs of outdoor dining emerged. As Rowlson explained, the first reaction of local political leaders was to worry about litter and noise. 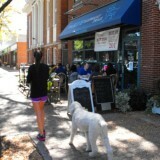 But despite the fact that the outdoor dining was technically a zoning violation, no enforcement actions were taken. Rowlson wanted to see what direction the market would move, and didn’t want to nip something that businesses were thinking might be good for them. 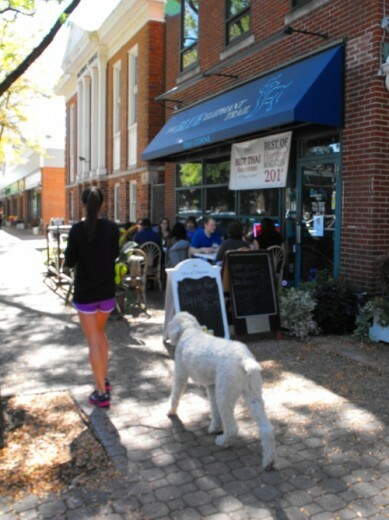 Indeed, over the following years, there would be a dramatic expansion in the amount of outdoor dining in West Hartford (and by 2003, you could finally get a permit for it). Just three of the more than dozen restaurants serving lunch to outdoor dinners in West Hartford Center. Long-time Connecticut planner Don Poland -- who has been doing a detailed study of the West Hartford Center for his PhD thesis in Geography at University College, London -- showed us a chart documenting the explosive growth in both the number of hospitality businesses (primarily restaurants) and the amount of outdoor dining over the past 20 years. In 1990 there were just two licensed establishments in the Center; today there are 27. 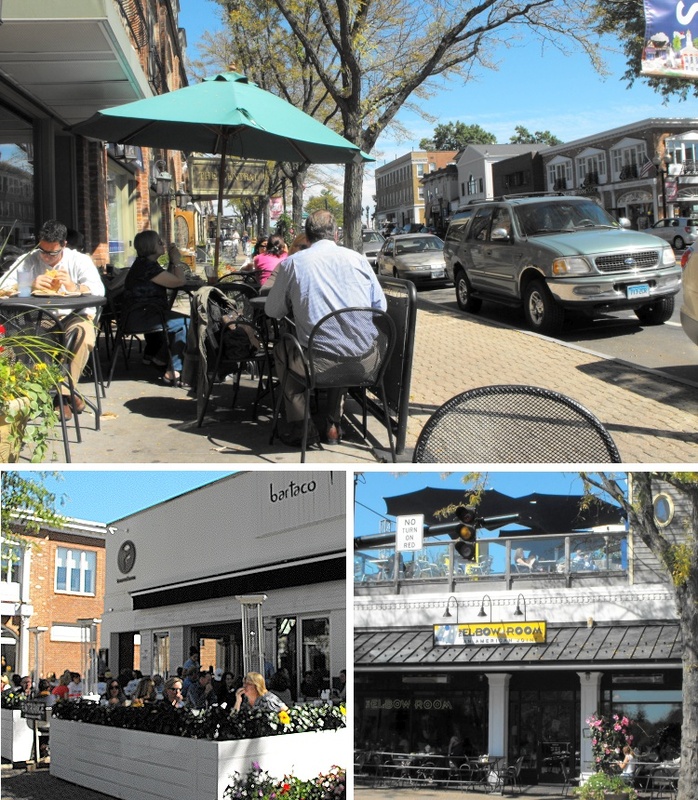 The number of outdoor dining seats has reached 750. [Editor's Note: I’ll be speaking more with Poland next month and reporting to you about some of the fascinating findings from his analysis]. With a strengthened West Hartford Center, Rowlson then seized on a big opportunity just across Main Street from the Center -- two large auto dealerships.